OLMSTED COUNTY, MINNESOTA, NEEDED A CAMPAIGN TO HELP KEEP PARENTS FROM HOSTING KID PARTIES AT THEIR HOUSES. THE IDEA WAS TO CREATE A NEIGHBORHOOD WITH THE FOCUS ON THE "PARTY HOUSE", THE RED SOLO CUP. 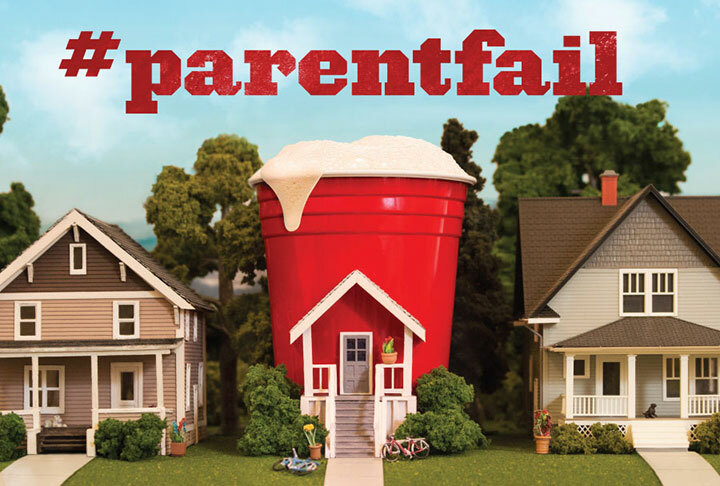 To keep the concept geared towards parents and their kids, we used the headline #parentfail. It felt fresh and young, yet powerful enough to get the attention of parents. We created a website featuring an intro video driving by the neighborhood, ending at the party house. To spread the word that people's homes weren't going to be party houses, we created an interactive map. Here, you can add your address and a special "no hosting here" pin will be placed. if you're a parent and you want to make sure your kid is going to a safe environment, you're all set.